Fynn Eckstein designs PAC., a personal, autonomous concierge system imaging the future of delivering packages. With his project the designer aims to change the actual parcel delivery considering that many miss the destinations and couriers are contributing to a large percentage of urban traffic. 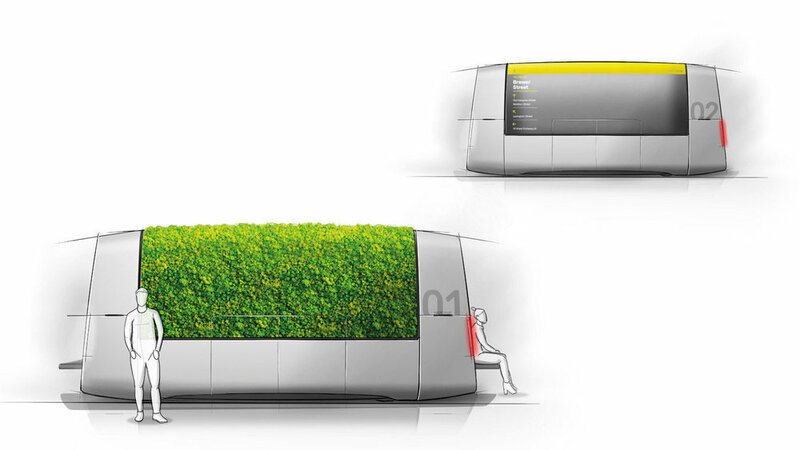 Eckstein creates a driverless service that adapts to users requirement’s and can be easily scaled during peak times. Microhubs are utilized as storage space, and small droids are delivering the parcels to the consumers. The Microhub, which is the core of the system, is an electrically driven and acts as a decentralized parcel warehouse. People who receive Parcels are benefitting from Pac, but its design offers different benefits for the whole community. They can be equipped with a semi-transparent OLED screen, to display a wide range of information. Alternatively, this area can be covered by moss to function as a natural air filter. Extendable benches, allow the hub to become a green oasis inside crowded city centers. These autonomous droids can store 10-25 parcels and distribute them on optimized routes. Thanks to their size, they can not only move on roads but also on bicycle paths or sidewalks. The satellite communicates via text messages. This allows a simple and intuitive way of communication because the user is already familiar with the tool.